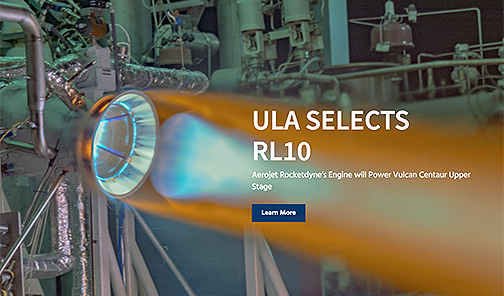 United Launch Alliance (ULA) has named Aerojet Rocketdyne as a strategic partner for the RL10 upper stage engine for ULA’s next-generation Vulcan Centaur rocket following a competitive procurement process. This partnership is a long-term agreement for Aerojet Rocketdyne to provide upper stage propulsion for the next decade. As part of this partnership, Aerojet Rocketdyne will provide RL10s and develop the RL10C-X, the next-generation of the RL10 family. The RL10C-X will increase the use of additive manufacturing and introduce other advanced technologies to improve the quality, reliability, affordability and performance. Over the course of nearly 60 years, more than 450 RL10 engines have flown on various ULA heritage vehicles with an unmatched record of mission success. ULA continues its competitive procurement process for the booster engine and plans to make a down select soon. Tory Bruno, ULA President and CEO, said that ULA and Aerojet Rocketdyne have a long and successful history together that began with the first flight of the company's Atlas and Delta rockets in the 1960s and the firm could not be more pleased to have selected the proven and reliable RL10 to power the Vulcan Centaur upper stage. Key determining factors to this selection included price and delivery schedule.